Seating: a few benches inside and several just outside the shop. Ice Cream: Close to 50 hard ice cream flavours made locally in small batches with high butterfat and low air content. Other frozen treats: milkshakes, smoothies, ice cream cakes and pints of ice cream available. 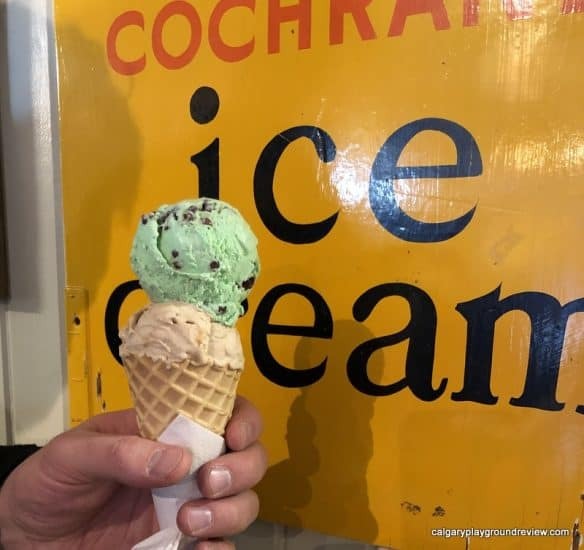 The MacKay family has been making and selling ice cream in Cochrane since 1948. 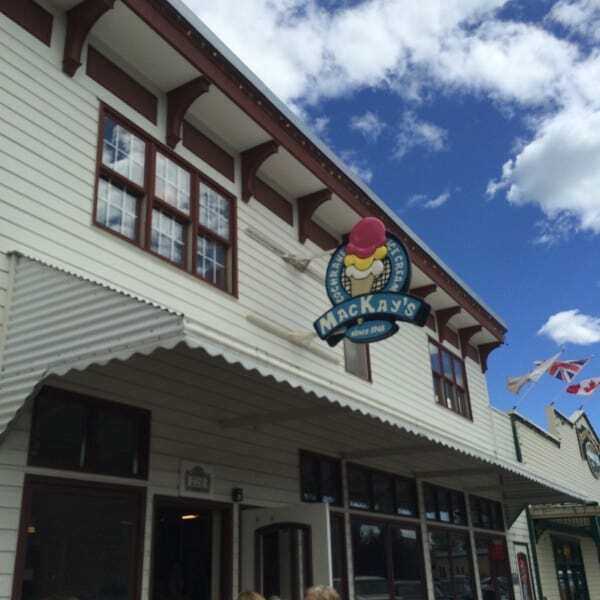 Now run by the third generation, MacKay’s is still synonymous with ice cream in Calgary. 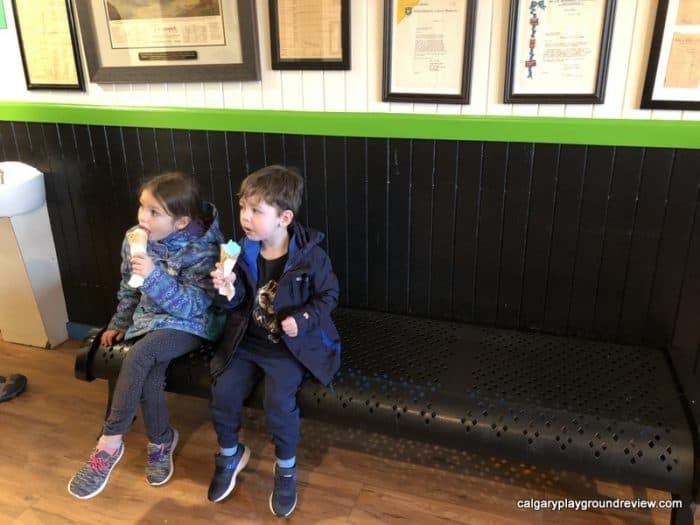 You can also get pints of ice cream and even ice cream by the scoop at different locations in Calgary (and elsewhere). But if you want the real MacKay’s ice cream shop experience you go to the source. 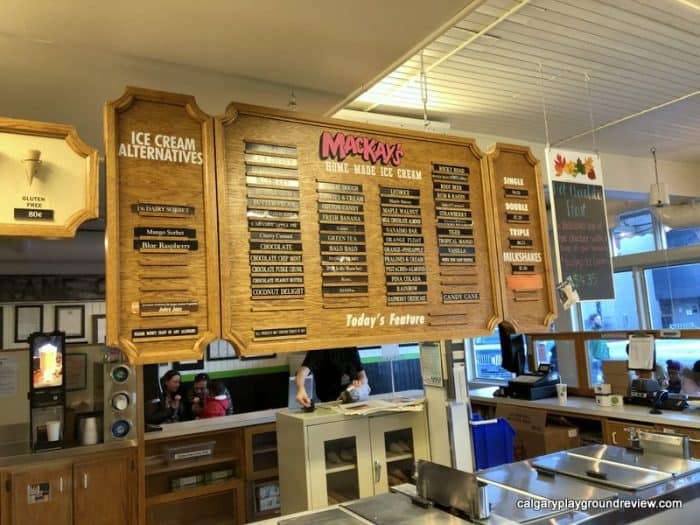 MacKay’s ice cream is richer creamier than many as they start with a cream base with a higher percentage of butterfat. Their flavours include old standbys like chocolate, strawberry and vanilla, flavors that remind me of my childhood like cotton candy and tiger and more unusual options like baklava, durian and avocado. We were at MacKay’s on Saturday afternoon in January. There was a steady stream of people. 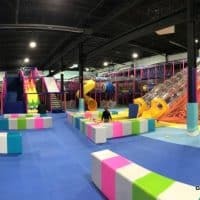 It is obvious they are prepared for a lengthy line during their busier season. There is bench seating along the wall on two sides. 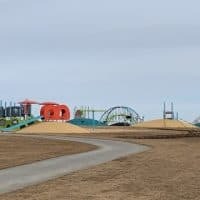 It’s not much in the way of atmosphere but at least you can stay warm on a cool day. If it’s warm enough, I would definitely choose to find a bench outside. 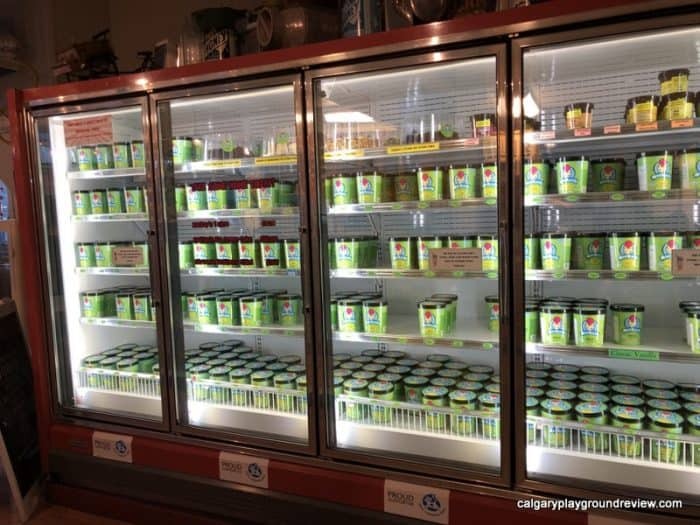 You can also get pints of ice cream from the cooler but you are probably better off picking it up locally if you are from Calgary. You can’t see the flavours as they are hidden in the coolers but they have a large posted sign that you can see from the line. 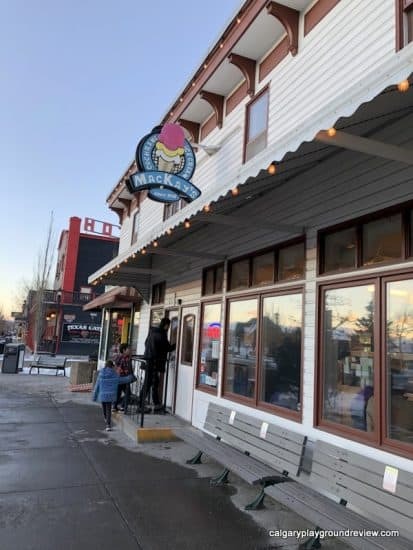 They serve ice cream in cups, regular cones, sugar cones (and gluten free sugar cones), waffle cones and chocolate dipped waffle cones. 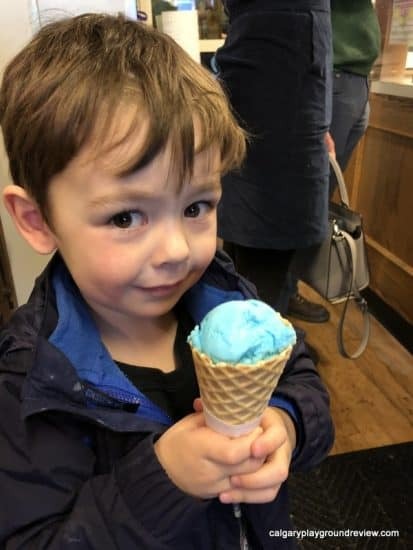 You can get a kid scoop, single, double or triple scoop of ice cream. MacKay’s currently serves sorbet that contains 1% dairy. 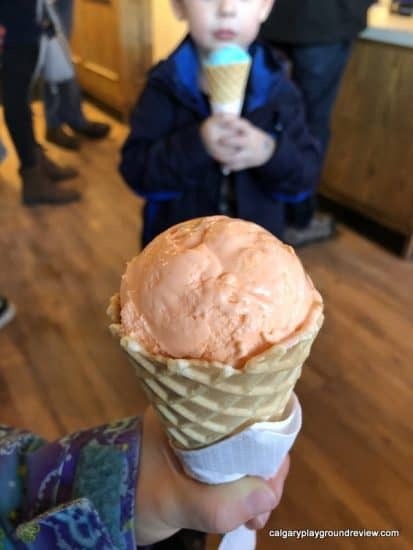 The kids each got a waffle cone with a kid scoop of sorbet. 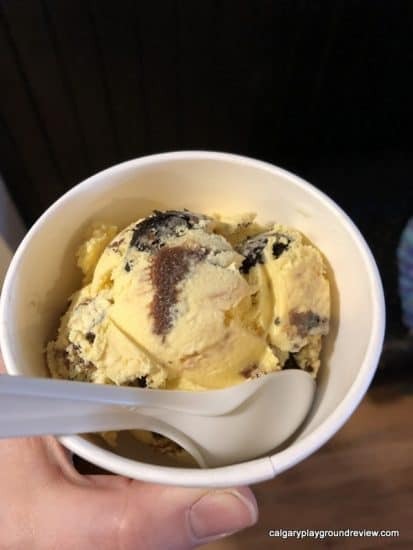 I got a single scoop of Nanaimo Bar ice cream in a cup because how many places can you get that? My husband got a double scoop of salted caramel and mint chocolate chip. 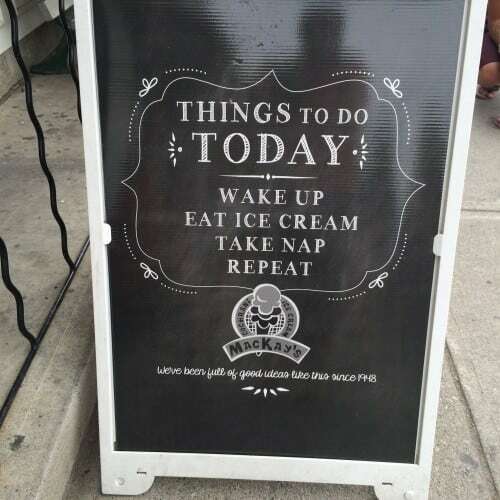 The ice cream was all delicious. 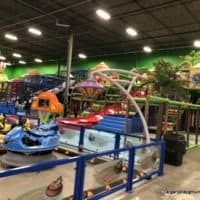 If you are in Cochrane, you should definitely make a point of stopping in. 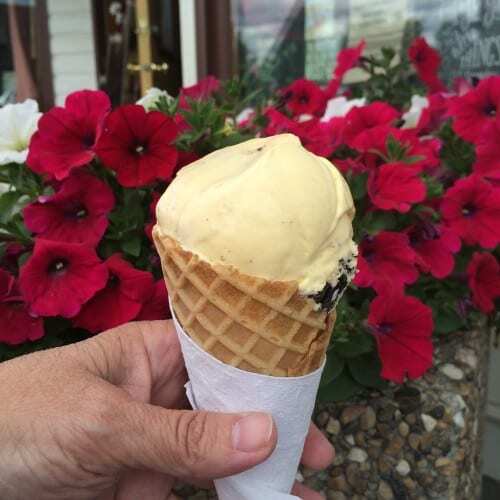 Have you been to MacKay’s Ice Cream? What did you think? 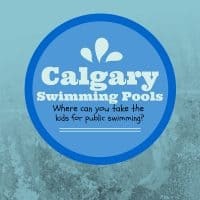 Previous Post: « Calgary Swimming Pools – Where Can You Take the Kids for Public Swimming?